Suffering from dry eyes and constant irritation? Eye Care Specialists can help! Chronic dry eyes occur when our eyes do not make the right quantity or quality of tears. When the cornea is not properly lubricated by our tears, vision can become blurry and our eyes are more susceptible to infection. 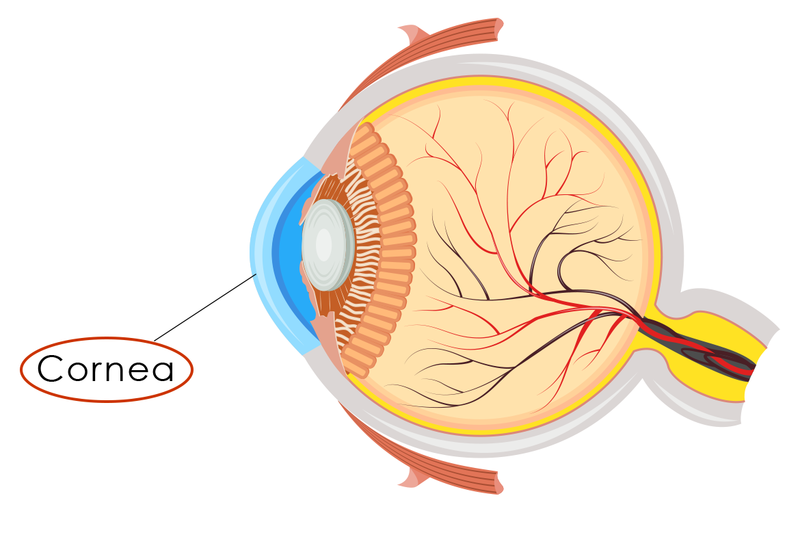 cornea: The clear, dome-shaped window at the front of your eye that lets light enter the eye for focusing. tear film: Tears are made up of three layers which nourish and lubricate the cornea and prevent dry eyes. The three layers together are known as the tear film. Tears do more than just communicate emotion or help us flush something out of our eyes. When we blink, a tear film coats the cornea. This tear film is necessary to lubricate, heal, and protect the cornea keeping the eyes comfortable and healthy. A healthy, balanced tear film is necessary for preventing dry eyes. Age: Tear production normally decreases as we age. Hormonal Changes and Gender: Women are more affected, especially during pregnancy or postmenopause. Climate or Environment: Areas with low humidity, cold or windy places, or a smoky environment can affect chronic dry eyes. Screen Time: Activities where we don’t blink very much for a prolonged period of time, such as viewing a TV, computer monitor, or smart device or just reading whether a paper book or electronic book, can cause dryness. Autoimmune Disease: Some diseases, such as rheumatoid arthritis, Sjögren’s syndrome, thyroid disease, and lupus, can cause the body’s immune system to mistakenly attack its own moisture-producing glands. Eyelid Conditions: Problems such as blepharitis, meibomitis, and rosacea affect the outer oily layer of the tear film, causing excessive evaporation of the eye’s natural tears. Medications: A variety of medications can cause chronic dry eye such as diuretics, beta-blockers, sleeping pills, antihistamines, anxiety medications, and pain relievers. LASIK Surgery: Dry eyes can be a side effect of laser vision correction. When it does not subside on its own post-surgery, you may experience continued dryness. Contact Lenses: Longtime contact lens wearers may find it more difficult to tolerate contacts due to the cornea being too dry. Since there is no permanent cure for chronic dry eye disease, prevention through lifestyle modifications and regular eye exams can aid your defense against dry eyes. Use a humidifier in the bedroom (especially in the winter) to add moisture to the air. Wear wrap-around sunglasses to decrease exposure to wind. Turn off all ceiling fans or any fans that circulate air and cause faster evaporation. Make sure car vents are pointing up or down but not directly toward your face. Practice the 20/20/20 rule: if reading or on the computer, every 20 minutes look at an object at least 20 feet away, for at least 20 seconds. Make sure you are looking slightly down at your computer monitor and not straight ahead or up. This allows your upper eyelid to slightly lower resulting in less eye exposure. You can have dry eyes and not even know it! In fact, ironically, a common symptom of dry eye is excessive tearing. Our eyes water as a response to irritation. In the past, doctors thought dry eye was caused by not making enough tears. Today, we know it’s not just tear quantity, but also tear quality. Healthy tears help lubricate, heal, and protect the surface of the eye. When your tears are not the right composition, dry eye occurs and affects your vision, causes irritation and inflammation, and increases the risk of an eye infection. conjunctiva: The clear tissue covering the white part of your eye and the inside of your eyelids which produces the mucus layer of the tear film. meibomian glands: The oil glands, located along the edge of the eyelids where the eyelashes are found, which make oil that is an important part of the eye’s tear film. 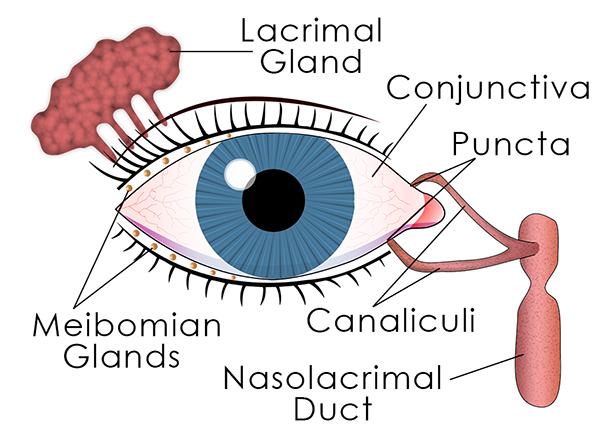 lacrimal gland: The gland above each eye that produces the water layer for the tear film. Our tears are not just saline. Three layers comprise our tears which contain enzymes, lipids, metabolites, and electrolytes to nourish our eyes.2,4 A healthy tear film, spreads across the eye when we blink ensuring the surface of the eye is smooth and clear. Without an adequate tear film, sharp vision is not possible. Our tears are not just saline. Three layers comprise our tears which contain enzymes, lipids, metabolites, and electrolytes to nourish our eyes.2 A healthy tear film, spreads across the eye when we blink ensuring the surface of the eye is smooth and clear. Without an adequate tear film, sharp vision is not possible. Mucus Layer: This layer, in direct contact with the cornea, helps “adhere” the whole tear to the surface of your eye allowing the water layer to spread evenly over the surface of the eye keeping it moist. This layer is produced by the conjunctiva. 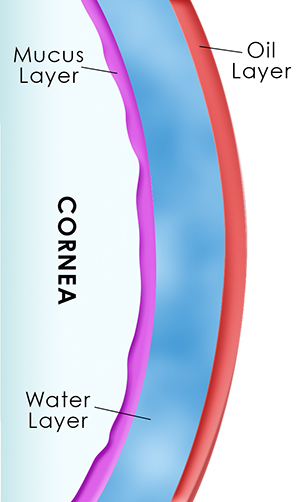 Water Layer: The water layer, the thickest layer, cleanses and hydrates the eye washing away foreign particles or irritants to protect the cornea. This layer is produced by the lacrimal gland. Oil Layer: The oil layer forms the outermost surface of the tear film, smoothing the tear surface and reducing evaporation of tears. This layer is produced by the meibomian glands. You’ve learned about three layers of a tear, if you are as fascinated as we are about this intricate function of the eye, click here to learn more about the three types of tears our eyes produce. The tear drainage system is an intricate system that drains our natural tears into the puncta, through the canaliculi, and into the nasolacrimal duct or “tear duct”. nasolacrimal duct: The tear duct where tears drain through the nasal cavity and into the back of the nose (sometimes causing your nose to run when you cry). canaliculi: Drain channels for tears to drain from the puncta to the nasolacrimal duct. puncta: The “drains” located inside the upper and lower eyelid near the nose where tears drain from the eyes. Slit Lamp Exam: By using an intense light, a slip lamp allows your eye doctor to closely examine the surface of your eye for signs of dryness. Eyedrop Dyes: Eyedrops containing dye allow your doctor to assess the surface condition of your eyes and determine how long it takes for your tears to evaporate. Schirmer Test: This test uses special blotting strips to measure how much moisture the strip absorbs and determine if your tear production is sufficient. Preservative or Preservative-Free Drops: If using artificial tears more than six times a day, drops with preservatives can add to the irritation. When using drops frequently or post-surgically, we recommend preservative-free drops. They come in vials and are good for 12 hours after you open them. When using artificial tears less than six times a day, a bottle drop is okay to use until the expiration date on the bottle. Drops vs Gels: Some drops have a higher “viscosity” meaning they are a thicker drop and stay on the surface of the eye longer. These drops and gels may lubricate the eye better but have the side effect of blurriness and therefore may be better for nighttime use. Although dry eye can cause redness, we do not recommend eye drops that promote reducing redness, such as Visine, as these drops can cause added irritation with prolonged use. Your doctor may use prescription drops to treat your chronic dry eyes. You may need to use a steroid drop initially to gain quick relief. Drops such as Restasis and Xiidra help reduce inflammation and promote your eyes to naturally produce more tears. Studies have shown nutrient-rich diets including omega-3 fatty acids not only benefit your overall health but especially your eye health. Omega-3 oils improve function in the meibomian glands, which produce the oily layer of the tear film. Your doctor may recommend a dietary supplement, such as fish oil, to treat your chronic dry eye disease. The drainage system in our eyes allow our tears to drain out of the eyes through the puncta. If your eyes are not producing enough tears, your doctor may insert punctal plugs to close off the puncta, allowing your natural tears to stay in the eye longer. Reflex tears actually contain antibodies to help fight bacteria. Our eyes release large amounts of reflex tears when our eyes are irritated and we need to wash away harmful irritants or foreign bodies that may make it into our eyes. For example, this is why your eyes water when cutting an onion. The fumes from the onion irritate our eyes triggering reflex tears. Emotional tears are likely what you think of as tears. Sad movies, difficult goodbyes, hard break-up all trigger emotional tears. Often, so many tears are produced they spill out of our eyes, also known as…, you guessed it, “crying!” Since the tears drain into the puncta through to the nasolacrimal duct in our nasal cavity, our nose tends to run as well. Some research shows crying can sometimes calm us because these tears release stress hormones. 1 Turbert, David. “Dry Eye.” American Academy of Ophthalmology, 20 Oct. 2009. Eye Over Time resources. 3 “Facts About Dry Eye.” National Eye Institute, U.S. Department of Health and Human Services, 1 July 2017, nei.nih.gov/health/dryeye/dryeye. 4 Mukamal, Reena. “Facts About Tears.” Edited by Devin A Harrison, MD, American Academy of Ophthalmology, 26 Mar. 2018, www.aao.org/eye-health/tips-prevention/facts-about-tears. 5 Gendler, Alex. “Why Do We Cry? The Three Types of Tears – Alex Gendler.” Lessons Worth Sharing | TED-Ed, 26 Feb. 2014, ed.ted.com/lessons/why-do-we-cry-the-three-types-of-tears-alex-gendler.